When the script for celebrated filmmaker Quentin Tarantino’s latest project leaked in early 2014, the writer/ director shelved the draft and threatened to never let it see the motion picture interpretation that many of his fans obviously wanted to view. After he hosted and narrated a sold-out live stage-reading of The Hateful Eight on April 19, 2014, in downtown Los Angeles at the Theatre at Ace Hotel, Tarantino changed his mind and decided to go forward with production on his latest script. The result is an ambitious, flamboyant blend of two of the director’s most well-received films: Reservoir Dogs and Django Unchained. 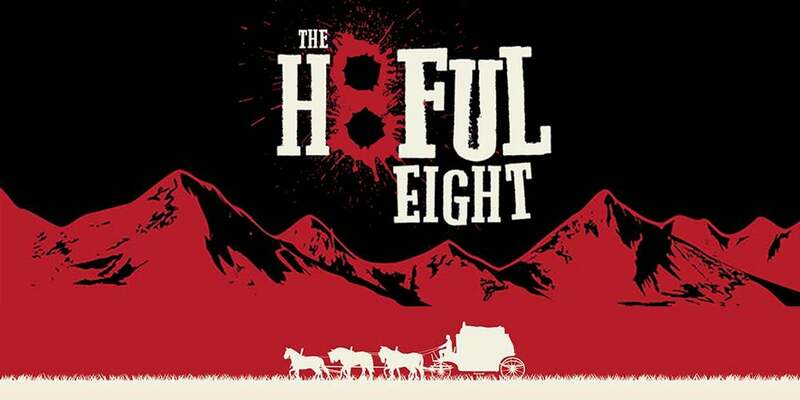 While more predictable than and not as original as the director’s other films, The Hateful Eight still triumphs as an excellent film-going experience if one has the patience for a runtime that runs a tad long. Like Reservoir Dogs, the majority of the plot takes place in a single room populated by men (and one woman in this case) who don’t trust a soul, suspicious and justifiably paranoid, culminating to a scene where several characters have guns drawn on one another. The other film from the director’s oeuvre that comes to mind is his previous work, Django Unchained. Like Django, the director’s newest film continues his perfection of the western genre—framing majestic shots of snowy mountains as characters face perpetual racial tension in a changing world. In fact, the character “Django” originally had a role in this script, as the first draft was titled Django in White Hell, but Tarantino admitted to “Collider” that he replaced the well-loved character, feeling Django served a “moral center” when the film focused on “disreputable characters.” Recall the line, “Ain’t nobody gonna cheat the hangman in my town,” from DU when “King Schultz” shoots the sheriff in the first act and apply it to your viewing of The Hateful Eight. The characters also mention the fictional brand of Red Apple cigarettes as the filmmaker employs his typical narrative structure, using nonlinear chapters to deliver his story. Tarantino often relies on well-known songs or musical selections from other films for the soundtrack of his movies, and while The White Stripes’ “Little Apple Blossom” can be heard in The Hateful Eight, the score stands as the first one original to a QT film. For his first fully original score, the director secured the services of 87-year-old and five-time Academy Award-nominee Ennio Morricone, famous for composing the iconic Sergio Leone spaghetti westerns. Despite the iconic composer’s falling out with Tarantino in 2013 over the implementation of a song Morricone wrote for Django Unchained, it appears the paycheck proved large enough for the aging maestro to collaborate with the long-time fan of his again. Appropriately, Morricone’s score creates the feeling of isolation and paranoia during scenes where these emotions aren’t obvious. Let it be said that when QT gets a composer, he goes for the best. Perhaps most amusing is that Morricone also scored the 1982 John Carpenter horror classic, The Thing, which resembles the plot of The Hateful Eight in more than a few regards beyond isolation in a blizzard. Just like each and every QT motion picture, the writing stands out as the film’s highlight—made prolific by excited, blistering performances from a cast comprised of talented, well-established performers. Tarantino gained legendary (I don’t use that lightly) The Thing protagonist Kurt Russell to lead this similar paranoid, blizzard narrative. 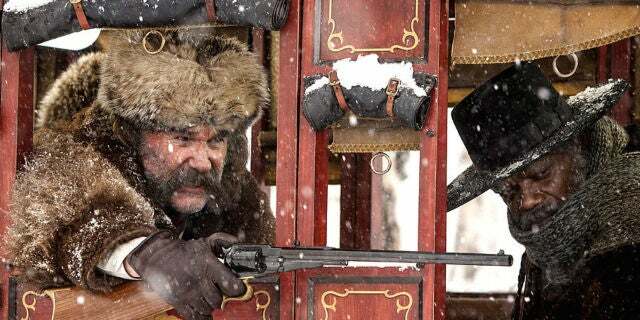 The Hateful Eight opens on a stagecoach stopping for Major Marquis Warren, sitting on a stack of frozen bodies in the middle of a raging blizzard. The stagecoach belongs to John “Hangman” Ruth, another bounty hunter who, unlike Major Warren, makes sure his bounties hang as opposed to presenting the authorities with a corpse. Russell (Furious 7, Bone Tomahawk) plays “Hangman” like an over-the-top John Wayne-type, chewing up the scenery and commanding viewer attention with his boisterous exclamations and unashamed paranoia directed at his fellow man. Academy Award nominee Samuel L. Jackson (Big Game, Avengers: Age of Ultron) plays Warren, a bounty hunter (his character replaced Django) and Civil War veteran from the Union Army. The Hangman feels reluctant to accept the Major into his stagecoach as he has a valuable bounty and senses that others may be after it. Jackson’s Warren seems more trustworthy than others, but is that simply because he fought for the Union? The bounty, however, takes the form of the only woman in the blizzard, Daisy Domergue. Jennifer Jason Leigh (Welcome to Me, The Spectacular Now) plays the most-wanted woman like a firecracker, unwavering at the thought of hanging and unafraid to speak her mind even if she knows she’ll get the Hangman’s elbow to her nose. The three share a nearly-almost-civil trip together in the stagecoach as they head for “Minnie’s Haberdashery” to hole up while the storm passes. Along the way and once they arrive, they meet the other members of the title’s namesake. Walton Goggins (Django Unchained, “Justified”) runs into frame as the new town sheriff on his way to get sworn in to his new position, another Civil War veteran who fought in his father’s militia in the Confederate army. Academy Award-nominee Bruce Dern (Nebraska, Family Plot) plays a racist curmudgeon of a Confederate general who never leaves his chair by the fireplace. Acting as they had in Reservoir Dogs, Michael Madsen (Donnie Brasco, Thelma and Louise) and Oscar-nominee Tim Roth (Selma, “Klondike”) appear as the “Cow-puncher” and the hangman, respectively. Madsen’s Cow-puncher stays largely quiet and brooding most of the time, a far-cry from his psychopathic performance in Reservoir Dogs while Roth plays his English hangman with flamboyance and confidence—not the everyman who fits in anywhere like Mr. Orange. With these eight souls holed up in a room while the storm passes, the Hangman understands the dangers of ferrying a live bounty in the company of people he doesn’t know and subsequently trust. Tensions mount as the snow piles up outside. The Hateful Eight features well-loved filmmaker Tarantino’s excitement for writing and making movies, even if the movie runs too long as the filmmaker tends to get caught up in his dialogue. The film grows increasingly predictable as hints get thrown out throughout the 168-minute motion picture (187 minutes if one is lucky enough to catch on 70mm). Exciting performances of interesting characters from famous movie stars make The Hateful Eight a worthy follow-up to Django Unchained. Expect Jennifer Jason Leigh’s vicious, haunting performance to stand out among her fellow cast mates when acting nominations come out closer to the Academy Awards as Tarantino’s script and Morricone’s score will certainly see their share of praise, as well. The director’s pastiche of western and horror/containment culminates to a welcome, entertaining reminder of John Carpenter’s The Thing.